Casa Encina is a beautiful comfortable old-looking house, with two terraces, to enjoy the sun and/ or shade. It is the house nearest to our communal pool. Composed as following: (ground floor only), entrance by terrace to large living room, two seated sofa, TV with satellite and DVD-player, radio-cassette-CD player. A fully equipped kitchen, dining area with four seats, bathroom with shower and toilet, and a royal bedroom, equipped with two individually beds (90 x 200 cm). Each window gives you a spectacular view at the garden, and the pool. On the terrace in the shade of a big old tree, at the backside of the house you could think you were alone on the world. Central electric heating.. Note: both the Finca itself as the pool are fenced. pero nosotros preferimos un contacto más personal con nuestras posibles huéspedes, por eso nos gusta más si usan el botón : ¨contacte con el propietario¨.. Muchas Gracias.. The surroundings are so beautiful, it´s pure nature, and aboveboard, nothing to do with our lifestyle in Holland. We live away from it all, but on the other hand, everything is so close, you can easily visit a lot of different towns and cities, each of them with their unique delights. But when you get back, entering the gate, you smell the garden , the pine trees and enjoy a soft blowing wind and you feel like you can be yourself..
bathroom contains washbasin, toilet and shower. Finca la Hijuela is about 15 minutes by car from the most beautiful beaches... El Palmar, La Fontanilla, el Faro de Trafalgar, Roche,..... There´s miles of fine sandy beaches waiting for you..
Electric heating included in rate. Linen provided, and we offer you a free once-a-week washing of the bedding/towels. 1x shower towel, 1 x hand towel. For use in the house, not by the pool or on the beach. We were at la Hijuela for the third time and when we arrived we felt at home immediately. The owners Carin and Carlos make sure that nothing is left to be desired when you arrive. 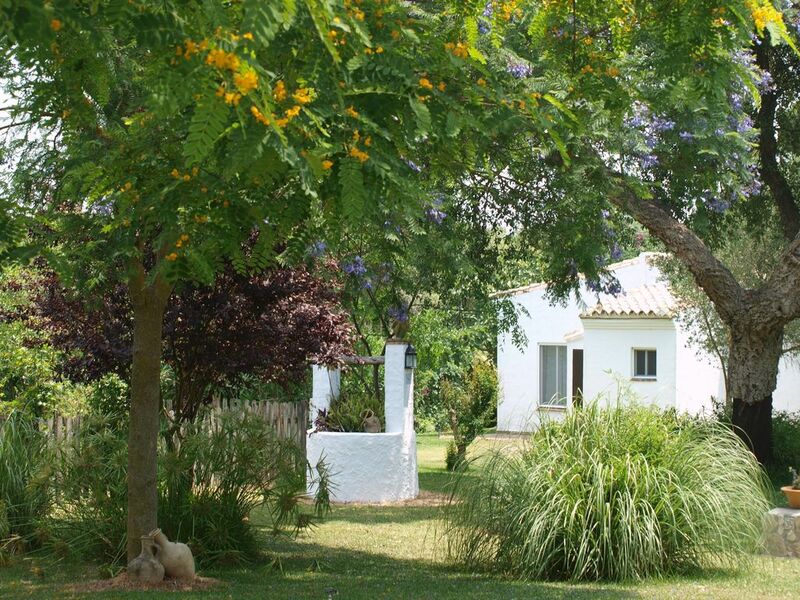 The finca itself is such a beauty - like a little paradise where you can recharge your batteries. We will certainly be back! P.S. La Muela itself doesn't offer many restaurants if you don't want to cook but there's one not very far away. It is called Patria and is well worth a visit. Do check there to find fresh Andalusian food served in style and with a view. Thank you very much ( again) for your lovely review and your presence here...It was our pleasure!! Hope to see you you back again..
We stayed for a week in Casa Encina which is within Carin and Carlos' beautiful tranquil garden. The casa was very clean and comfortable with a terrace overlooking the swimming pool and garden. We thoroughly enjoyed our stay there, whether relaxing on the finca or exploring the local area with its great beaches. hope to see you back sometime!! Great verdulant and nicely arranged property. Karin and Carlos could not have done more. Fell in love with Coco- one of the dogs! Perfect hideaway. A tranquil paradise. Beautifully landscaped gardens. The chalet was comfortable and well equipped with charming touches. You are perfectly located to explore local towns and beaches and then return to get away from it all and relax on your terrace or by the pool. Wunderschönes Haus und Anwesen mit Natur pur! Wir haben unseren Urlaub auf der Finca La Hijuela mehr als genossen und kommen definitiv wieder! Die Finca ist wunderschön und absolut ruhig gelegen und verspricht Erholung pur. Das Haus ist liebevoll und authentisch eingerichtet mit allem was man braucht (das einzige was wir vermisst haben, war ein Wäscheständer für drinnen, aber auch hier hat uns Carin sofort weitergeholfen). Es gibt die Möglichkeit, frische Eier von Carin's und Carlos Hühnern zu kaufen, was wir einfach nur großartig fanden! Auch unsere kleine Tochter hat die Zeit auf der Finca sehr genossen und fand insbesondere den Kontakt zu den Tieren (Hunde, Katzen, Hühner, Schildkröten), das Trampolin und den wunderschönen Garten toll! Die Besitzer Carin und Carlos, die auf der Finca wohnen, sind sehr nett und freundlich und gaben uns einige hilfreiche Tipps - danke für die tolle Gastfreundschaft! Trotz, dass vier verschiedene Häuser auf der Finca vermietet werden, hat man ausreichend Privatsphäre und bekommt von den anderen Gästen wenig mit, da die Finca riesig ist. Von der Finca hat man - ein Mietwagen ist vorausgesetzt - zahlreiche Möglichkeiten, die Umgebung zu erkunden. Wir haben einen Tagesausflug nach Tarifa unternommen - ein sehr nettes kleines Städtchen mit Flair. Die Strände in Conil sind außerdem nur 15 min mit dem Auto entfernt und für Kleinkinder absolut empfehlenswert - unsere Tochter wäre am liebsten in den Ozean gesprungen, aber leider war das Wasser noch zu kalt. Auch wir fanden die kilometerlangen, breiten Sandstrände von Conil wunderschön für ausgiebige Spaziergänge oder zum Sonnenbaden. Wir planen auf jeden Fall wieder zu kommen und würden die Unterkunft wärmstens weiterempfehlen!!! Vielen Dank fur diese schone bewertung! Ich hoffe es geht euch gut dieses jahr und vielleicht sehen wir uns wieder!! Finca la Hijuela is the perfect place to combine disconnecting and doing culture.You can find it all within 100 km.!! Ancient Cadiz, Jerez with bodegas and the horse riding school, Seville with its Moorish architecture and Flamenco Tablaos, Tarifa (the ruines of Baelo Claudio), Trafalgar, as also Vejer, and Medina Sidonia are worth a visit. And when temperature keeps rising, there are excellent beaches nearby. More than 15 km of fine sandy beaches, laying just there to be enjoyed by you. Sometimes you can see Morocco. It is easy to do your shopping, on the local fresh-markets and there are enough (super)markets and shopping malls in Conil (10 min. ), Vejer (7 min. ), and Chiclana. Several good restaurants are nearby, some in real surprising locations. In summer evenings you can assist to the many local ferias. Do not feel like driving, culture, people? In our garden you can submerge yourself in a cool big salt-water pool, (10 x 5 m) and hear the birds sing. Just take a swim and relax. Also available for Yoga retreats..Aks for information. Other Activities: What about listening the birds sing and have a quiet swim?